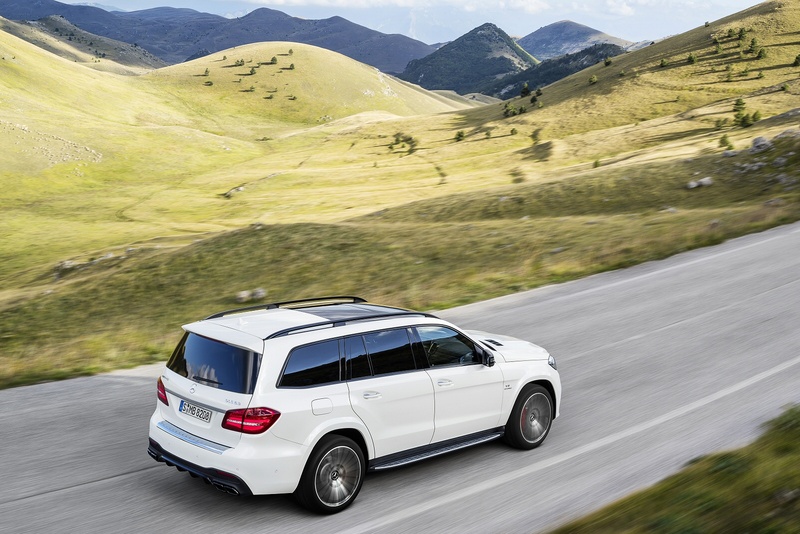 This Mercedes GLS, if you haven't yet come across it, is a vehicle billed as 'the S-Class of SUVs', a luxury conveyance for those whose real - or more likely imagined - commute to the real world is from a craggy mountaintop. 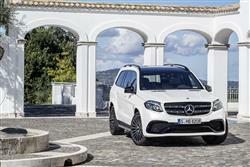 You'd probably know this model better as the 'GL-Class', but Mercedes has updated that design with smarter stylng, greater comfort, more agile driving dynamics and what it thinks is 'best in class' safety standards. Hence the change in badgework from 'GL' to 'GLS'. 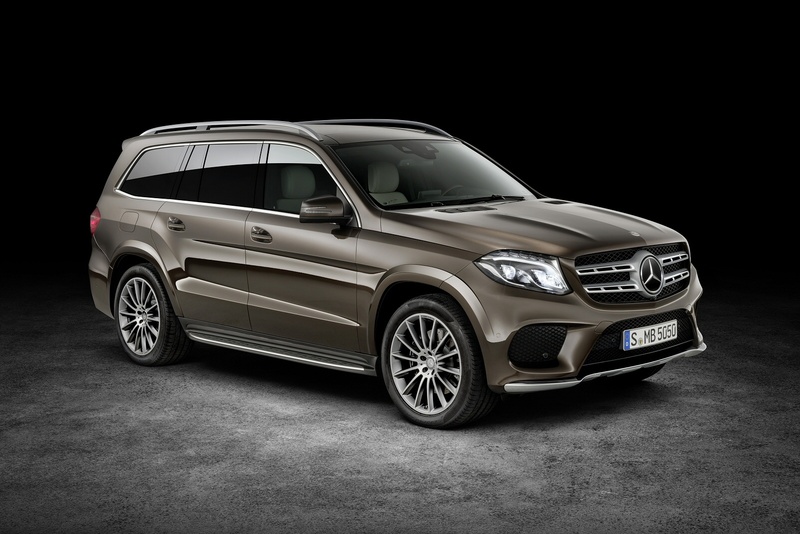 Whatever you want to call this car, it sits in Mercedes' SUV range mid-way between the recently introduced GLE-Class model (that replaced the old M-Class); and huge the go-anywhere G-Class SUV that's really for off road enthusiasts only - albeit those with a lottery win in their pocket. 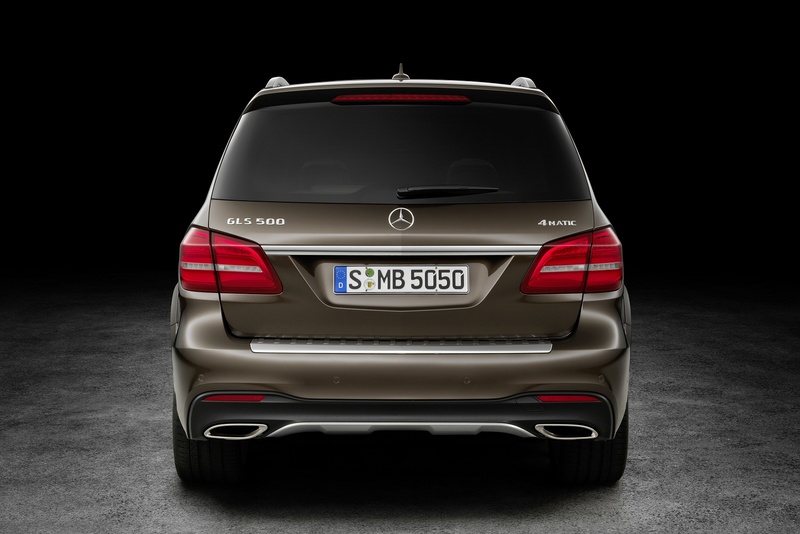 Back to the GLS model though. It's this design's third seating row that's always set it apart in a luxury 4x4 market that rarely offers this option - or if it does, often restricts practical use of the extra seats to children. Not so here. 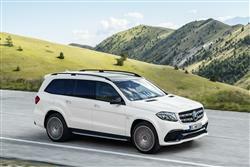 The GLS isn't any bigger than its GL-Class predecessor, but it should be subtly nicer to ride in, thanks to the brand's latest AIRMATIC air suspension system, a smoother 9G-TRONIC auto gearbox and all the latest elematics. Let's check it out. 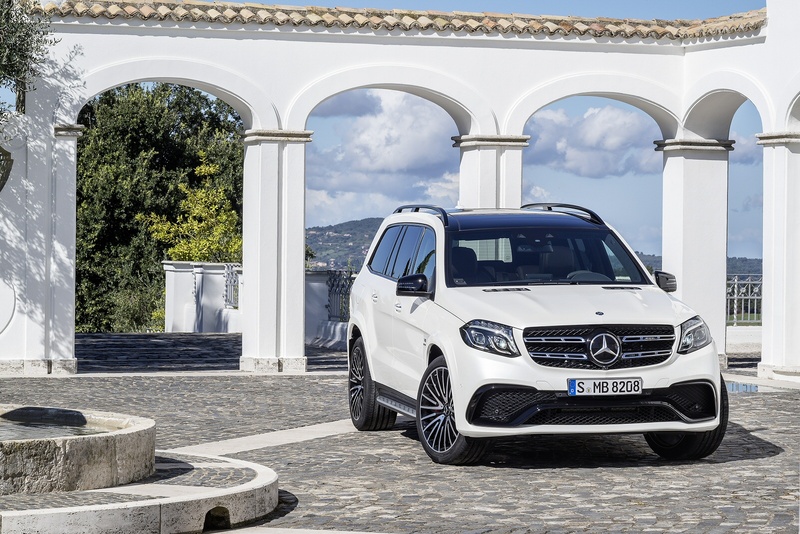 Not everyone is going to feel comfortable piloting something of this size but provided you do, then Mercedes GLS motoring is a pretty fabulous way to view your everyday world. Engines are the same as they were in the old GL-Class range. 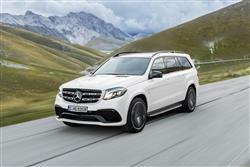 The GLS 350d variant that most will buy uses a 3.0-litre V6 diesel powerplant, which produces 258bhp and 620Nm of torque. The 9G-TRONIC automatic gearbox now has 9 speeds rather than 7, making for greater efficiency and smoother shifts, and it offer DYNAMIC SELECT driving modes if you feel like pushing on a bit. We can't imagine many GLS customers are going to risk taking this model off road, but for the few that might, there's an optional off-road package for the 350d adds a centre differential lock, a low-range gearbox, extra modes for the DYNAMIC SELECT system and three additional heights for the suspension that increase ground clearance to 306mm and wading depth to up to 600mm. Also included are underbody protection panels and an off-road function for the headlights. 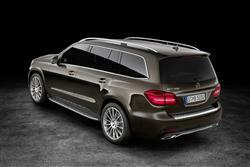 For those who don't care about running costs, a V8 petrol AMG option continues on at the top of the range. With a peak output of 585bhp and peak torque of 760Nm, the 5.5-litre bi-turbo V8 in the GLS 63 offers 28bhp more power than its GL-Class predecessor, plus more dynamism and higher equipment levels than before. Standard features include a revised AMG SPEEDSHIFT PLUS 7G-TRONIC transmission with AMG DYNAMIC SELECT transmission modes which provide optimum flexibility, and rear-biased AMG Performance all-wheel drive. So, it's big - of course it is, large enough maybe to make your neighbours question their right-to-light restrictions. This MK2 SUV is long, wide and tall, with more than three metres between its wheels and a total length of nearly 5.2m. So you'll need a very large garage. 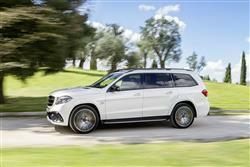 The styling now incorporates the latest Mercedes-Benz look. The smarter front end includes distinctive power domes on the bonnet, while among changes at the rear are more prominent tailpipes. Interior highlights include a classier instrument panel, a redesigned three-spoke multifunction steering wheel and a modified centre console with touchpad. The AMG Line pack includes distinctive front and rear bumpers, illuminated side running boards, and 21-inch AMG light-alloy wheels. The optional Night package makes for an even more exclusive look, with high-gloss black details including the louvres in the radiator grille, door mirrors and roof rails. Right, onto the interior. The fact that it offers three seating rows at all is fairly unusual in the super-luxury SUV sector and the fact that in that third row, two fully sized adults can be properly accommodated is even more unusual. Find yourself in the middle row and, as at the very back, there's reasonable head and elbow room, with decent space for three people who can adjust their seats to suit their needs. There's a boot volume of 295-litres (with all seats in place), 680-litres (with the third-row seats folded) or 2300-litres (with all rear seats folded), in a load compartment that is up to 2124mm long and with a payload capacity of up to 815kg. Buying a Mercedes GLS is pretty straightforward. 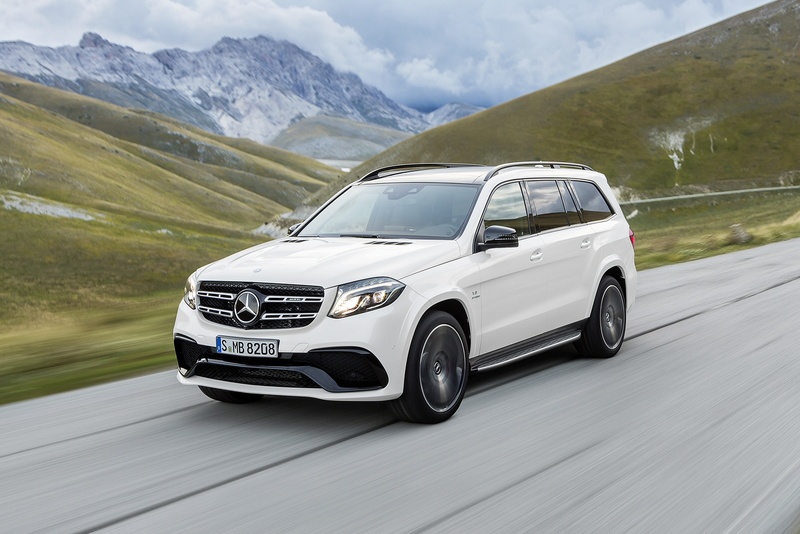 Though there's a wild AMG V8 petrol GLS63 model at the top of the range, almost all customers will want the single more sensible diesel variant, the GLS 350d diesel, for which you'll need around £69,000. It's a car that comes fully kitted out in UK guise, but as we'll see, that doesn't mean there isn't plenty of scope to get creative if you've the budget to do it. Standard kit is comprehensive and includes the latest generation of Mercedes' 'COMAND Online' infotainment system, including an 8-inch screen and touchpad. There's also AIRMATIC air suspension with adaptive damping, an LED Intelligent Light System with Adaptive Highbeam Assist Plus, leather upholstery, memory front seats, a Harmon Kardon Logic 7 surround sound system, a panoramic electric sunroof, a parking package with a 360?? camera. You also get a lane tracking package including Blind Spot Assist and Lane Keeping Assist, a Keyless-GO comfort package, THERMOTRONIC climate control with three zones, three-colour ambient lighting and heated seats in the front two rows. 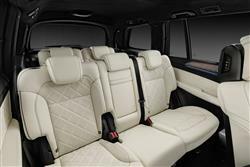 The optional 'designo Line' package brings even more luxurious appointments, including designo nappa leather upholstery with diamond pattern quilting, heated and cooled front seats, a heated steering wheel, four-zone climate control including the third row of seats, temperature-controlled cup holders and interior air ionisation with filter. Also included is the Active Curve System, which uses active suspension stabilisers to help reduce the rolling motion of the vehicle in mid- and high-speed bends. It also helps increase axle articulation off-road. 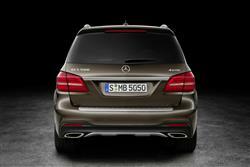 Mercedes has put a lot of thought into trying to make this car more efficient. 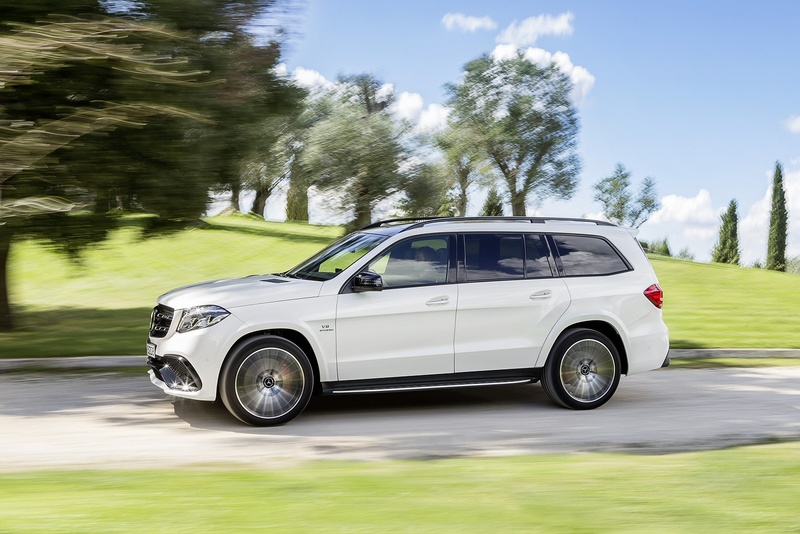 As a result, the volume GLS 350d variant's CO2 emissions are down from the 209g/km CO2 figure achieved by the old GL350 BlueTEC diesel model to 199g/km this time round. 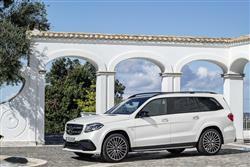 Emissions really are very clean for an SUV this big, meeting EU6 standards thanks to the adoption of Mercedes' Selective Catalytic Reduction technology and the installation of what's called 'AdBlue injection'. AdBlue is an aqueous urea solution that's injected into the exhaust flow to increase ammonia. This then transforms 80% of the vehicle's NOx emissions into harmless water and nitrogen in the catalytic converter. That just leaves the flagship petrol-powered GLS 63 AMG model to consider, a car that also gets a start/stop system and a 'Controlled Efficiency' driving mode. Despite that, it's a model that was always going to accumulate plenty of tiger tokens. Most owners will be lucky to manage more than 20mpg in regular use but emissions of well under 300g/km are better than you'd get from a less powerful supercharged 5.0-litre V8 Range Rover or Range Rover Sport. Good residual values will help soften the running costs blow when the time comes to sell up. 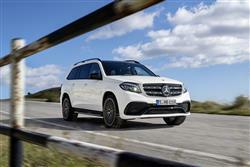 And insurance groupings are set at 49 for the diesel and a top-of-the-shop 50 for the GLS63. If you�re looking for a new Mercedes-Benz GLS 350d 4Matic AMG Line 5dr 9G-Tronic Diesel Estate for sale, you�ve come to the right place. At Bristol Street Motors we don�t just have the best Mercedes-Benz GLS 350d 4Matic AMG Line 5dr 9G-Tronic Diesel Estate deals, we also offer friendly advice and help with all your enquiries to ensure your buying experience is a happy experience.